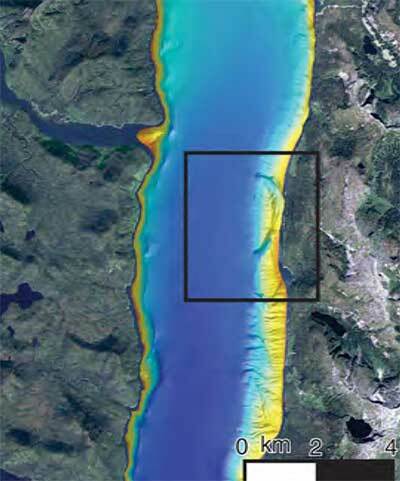 This photograph from the geomorphology report shows how bedrock spread lead to catastrophic landslides along a 2.5 kilometre scarp (photo lower centre to upper right) and a 1.3 km scarp (photo distance) on the ridge above Parrott Creek. 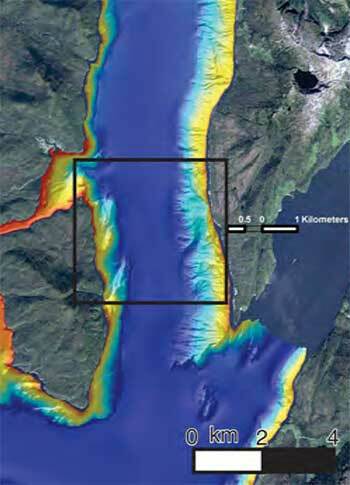 The yellow dashed line delineates the landslides’ headscarp. The arrow shows the direction of movement. A retired geomorphologist for the BC Forest Service, who lives in Smithers, says a break in the Enbridge Northern Gateway pipeline, triggered by a landslide, is “inevitable” given the highly complex terrain that the pipeline will cross. 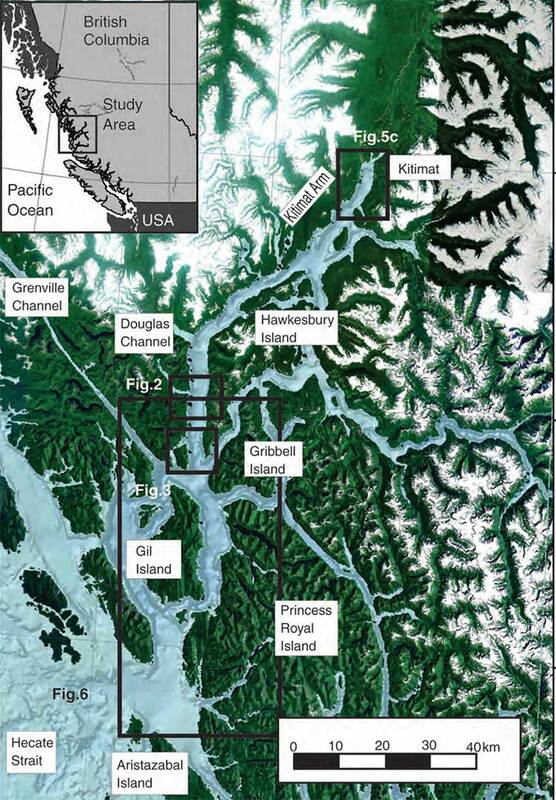 James Schwab bases his peer-reviewed paper on his 30 years experience in northwestern British Columbia. “The unstable mountainous terrain across west-central BC is not a safe location for pipelines. Eventually a landslide will sever a pipeline,” he says. He calls for investigation of a safer, alternative route for the pipeline. The report was funded by the Bulkley Valley Research Centre. 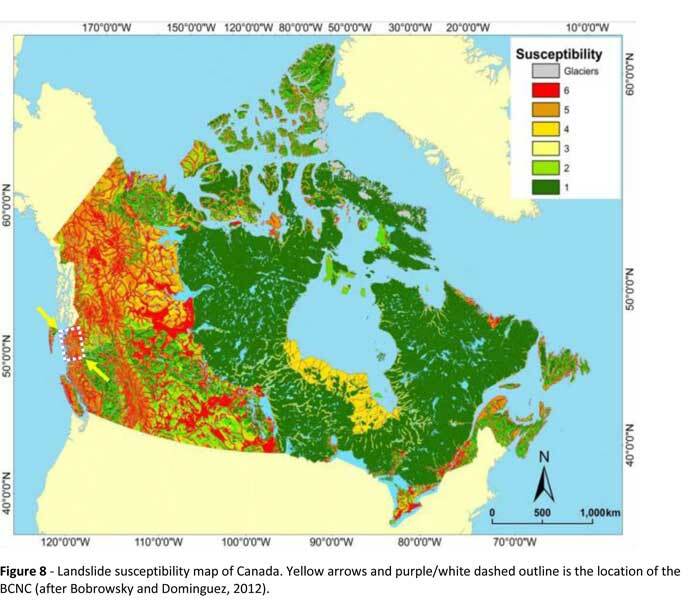 It examines three areas, the Nechako Plateau, the Hazelton Mountains and the Kitimat Ranges. 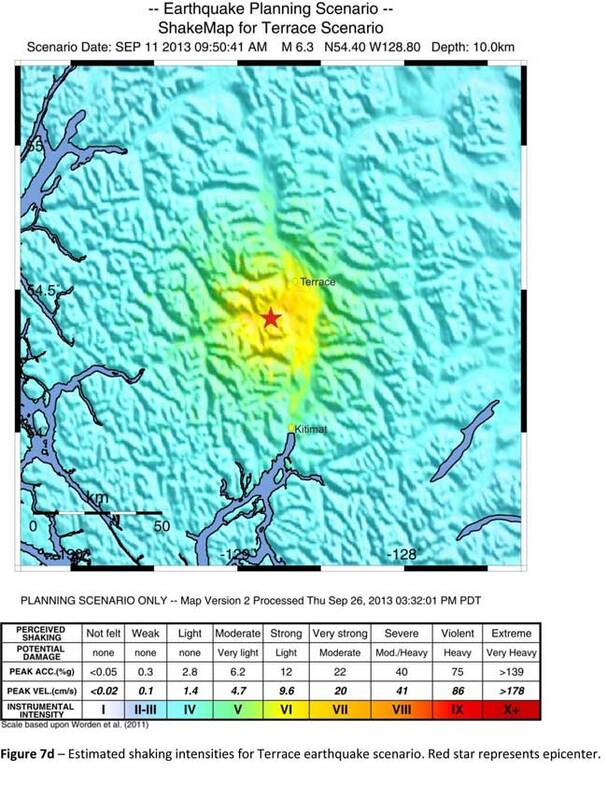 Schwab’s report says the Nechako Plateau appears relatively benign, but, he says, large landslides have occurred in volcanic rock overlying other older volcanic and sedimentary rock. At Gosnell Creek, Schwab says, shifting channels on active alluvial fans pose road maintenance challenges at present and, he says, pipelines will likely bring similar challenges crossing these fans. The report says the creek banks are unstable at Crystal Creek and Gosnell Creek pipeline crossing points. 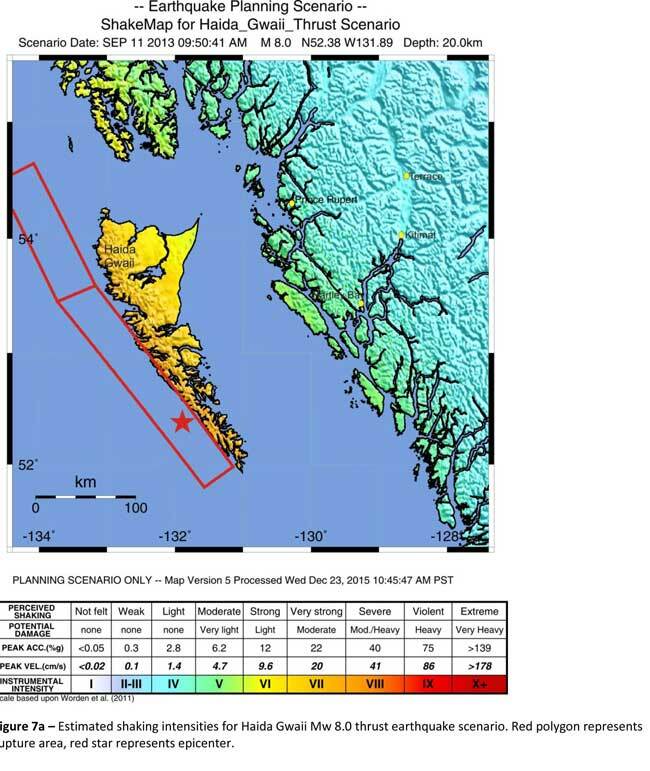 The report says the volcanic bedrock of the Hazelton Mountains is “inherently unstable” and geological surveys show there were many landslides in prehistoric times. Three more recent documented large landslides within the Bulkley Range of the Hazelton Mountains have severed the natural gas pipeline since its construction in the early 1970s; large landslides have also impacted forest roads and highways. He says that gravity is deforming the slopes in the volcanic bedrock found in the Kitnayakwa, Clore and Bernie watersheds and the report calls for a thorough geotechnical investigation to determine the stability of the bedrock and hill slope in areas before the pipeline is built. “Avoidance of these unstable hill slopes is generally the preferred engineering development option,” the report says. The report examines where the pipeline corridor crosses through a mountainside to the southeast of the Clore Canyon. The highly fractured bedrock in the canyon is undergoing active mass erosion. unstable rock reaches up to about 1200 m above sea level and extends around the mountain into an adjacent tributary valley. This bedrock along the north and west side of the mountain is extensively gullied and contains many landslide scarps and an actively moving landslide. The active instability of the eastern mountain slope places major constraints on development, Schwab says. Schwab says the Kitimat Ranges are characterized by steep narrow valleys, which create “colluvial-fluvial fans … at the base of most steep gully channels in the Hoult Creek and Upper Kitimat watershed.” The steep gullies extend from the mountains in to the valley or directly into Hoult Creek or the Kitimat River. Many of these high-energy systems in the Kitimat Ranges experienced debris flows during extreme rainstorms in the fall of 1978 and the fall of 1992. Debris flows commonly occur under seemingly normal storm events during summer convective storms and fall frontal rainstorms. Debris flows are powerful landslides that can damage or rupture pipelines, the report says. 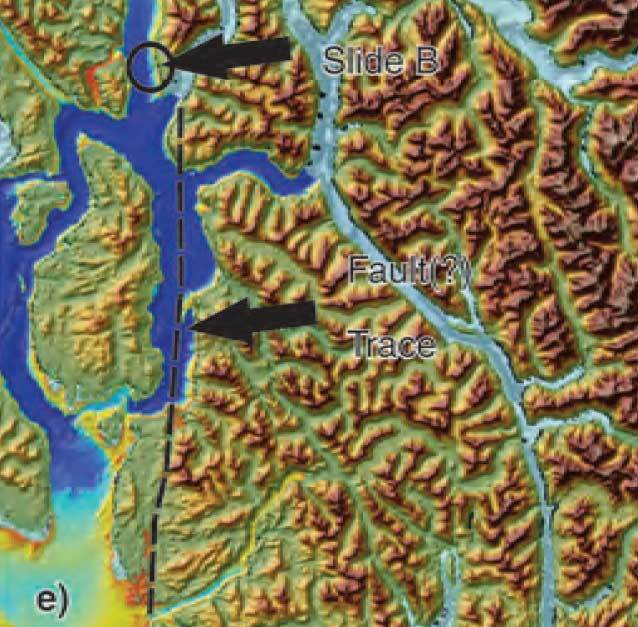 Hunter Creek, a large active alluvial fan, has historically pushed the Kitimat River across the valley, Schwab’s report says. 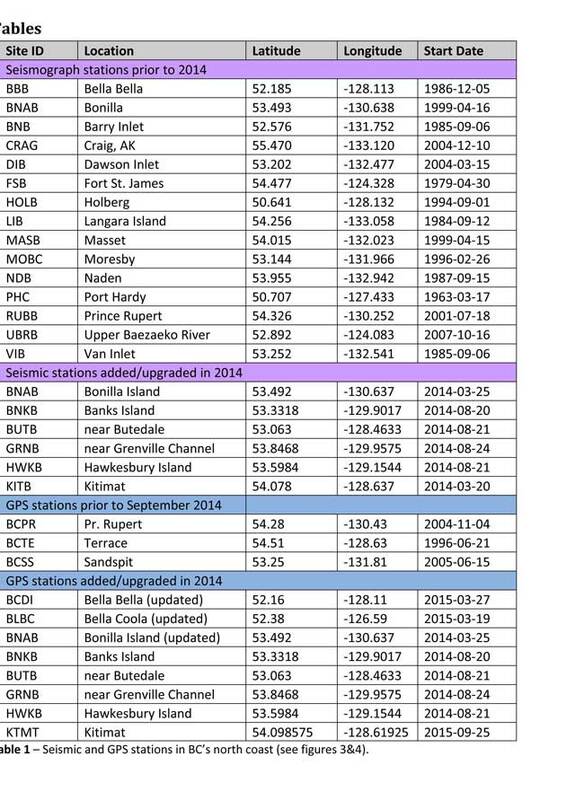 In 1992, road and levée construction caused a catastrophic channel change. The Kitimat trough, on the road between Terrace and Kitimat, is actually a fjord uplifted by ancient geological forces. The valley has deep deposits of sediments both from ocean and land, left by glaciers, which have produced landslides from prehistoric times to the present day. 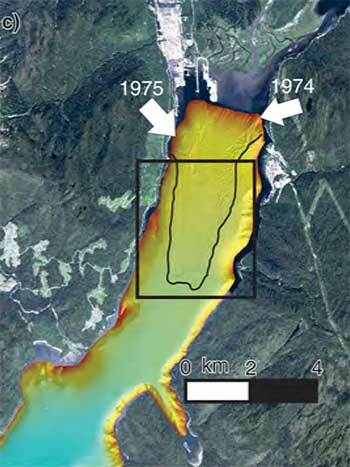 Recent large flow slides occurred at Mink Creek (winter 1992-93) and Lakelse Lake in May and June 1962. 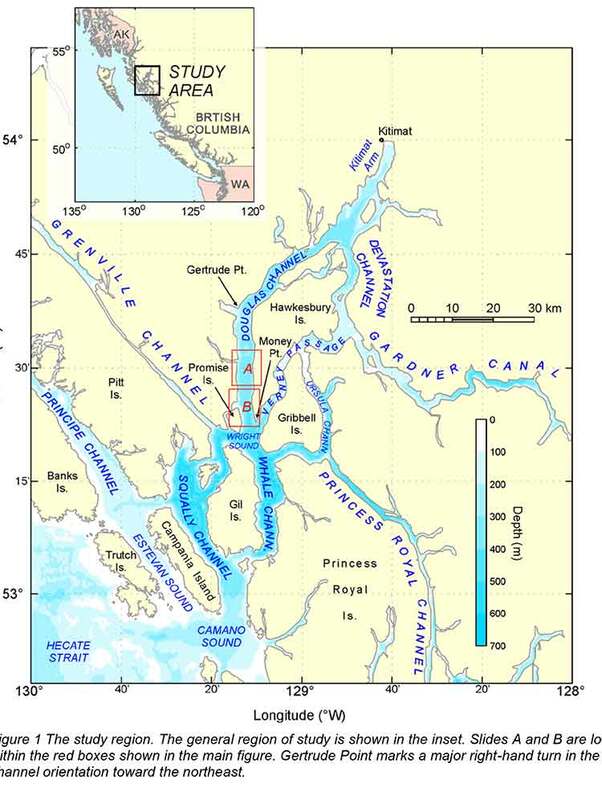 A large submarine flow slide occurred in sensitive marine muds at the front of the fiord-head delta at Kitimat Arm in April 1975. 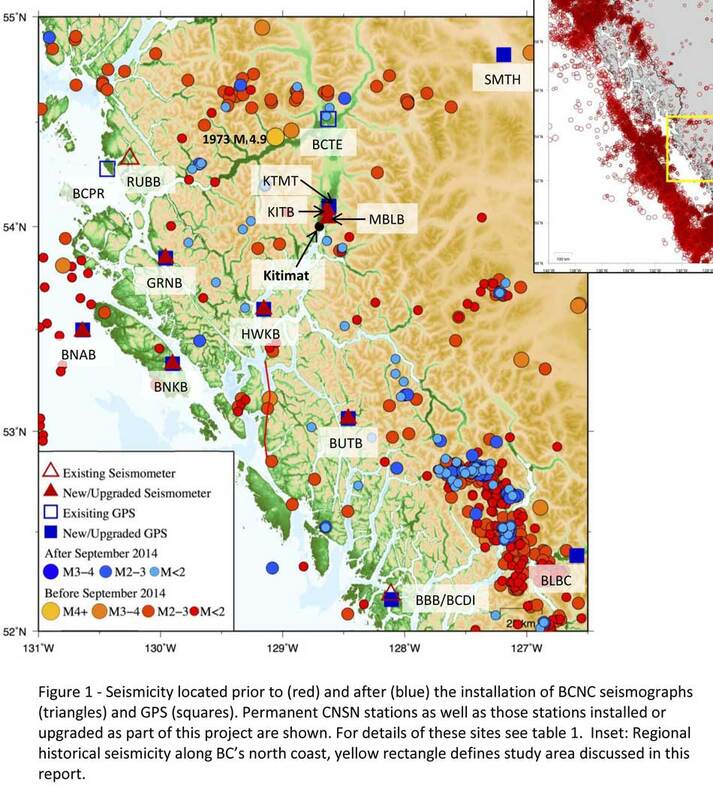 These recent landslides serve to show the continuing sensitivity of the glaciomarine sediments in the Kitimat Trough and the marine sediments on the fan-delta at the fiord-head of Kitimat Arm. 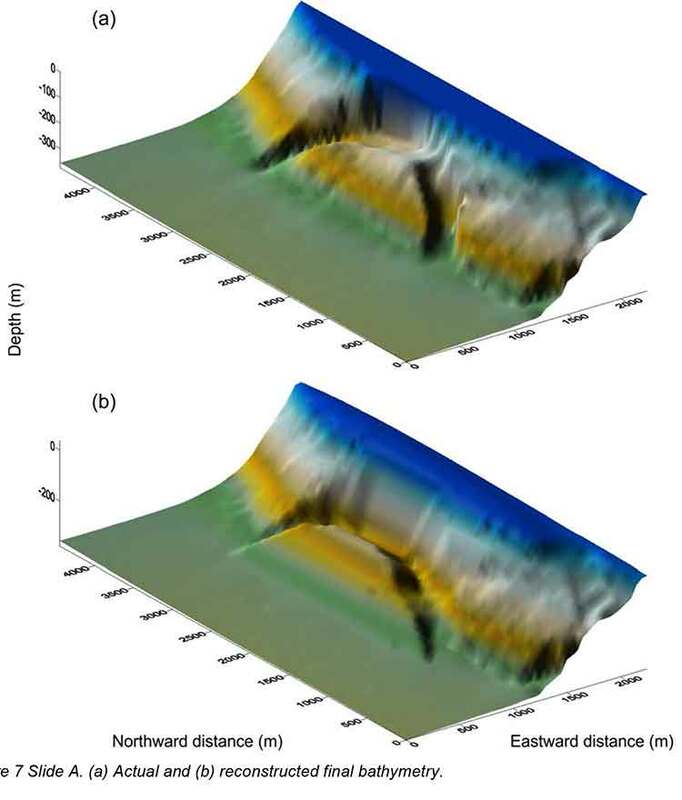 Natural and human caused factors such as increases in surface load, removal of lateral support by stream bank undercutting or excavation, vibration by heavy equipment, earthquake shock, high water pressures and interruption of intertidal drainage can trigger these landslides. Thus, the potential exists for landslides to occur during pipeline construction and in the future. This large swampy area on Lakesle Lake is the location of the May 1962 flow slide. Highway 37 crosses the landslide depletion zone. (The highway was closed for several days after the 1962 slide.) 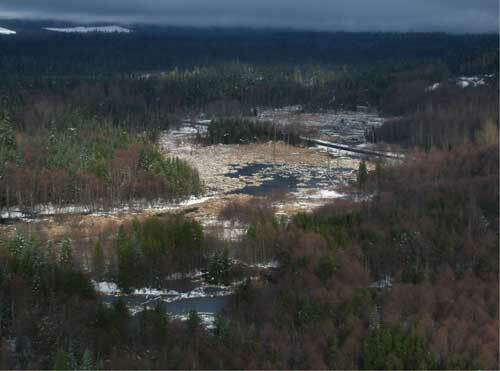 The provincial park is in the middle left of this photo from the report. 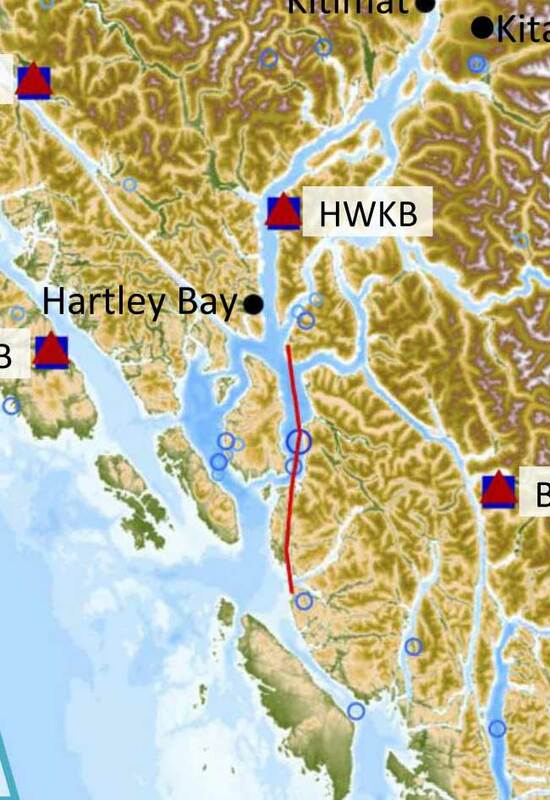 Schwab says the pipeline will encounter the glacial sediments during construction at Cecil Creek, Deception Creek, Wedeene River, Little Wedeene River, along the west side of Kitimat Arm and along Chist Creek. He says that even minor erosion along those creek banks can expose the glacial sediments, which are then displaced by as the sediments are exposed. The executive summary of the report concludes by saying. Landslides travel long distances and damage linear infrastructure such as pipelines. Six large rock slides occurred in west central B.C. since 1978, five of these since 1999, and four since 2002. Three of the six rock slides severed the natural gas pipeline (Howson landslides in 1978 and 1999, and Zymoetz landslide in 2002). Damage to linear infrastructure commonly occurs in run out zones many kilometres from the initial landslide. 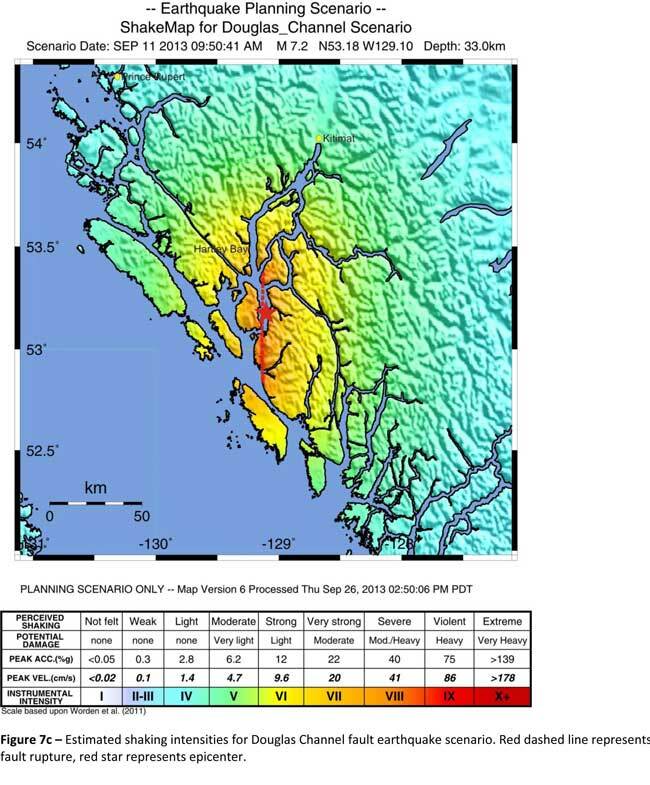 This has occurred with recent landslides in west central B.C. ; the longest traveled in excess of four kilometres along a slope of 9°. Therefore, the potential for damage to pipelines extends to unstable terrain and potential landslides that start well outside the construction corridor. 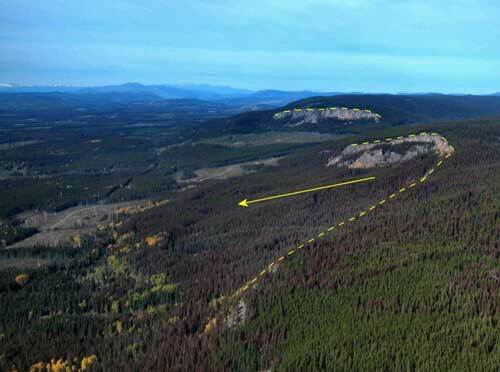 This report was corrected on Oct. 25, changing the headline, correcting the main link to the Bulkley Valley Research Centre that was not visible due to a coding error and adding a link to the geomorphology report news release.